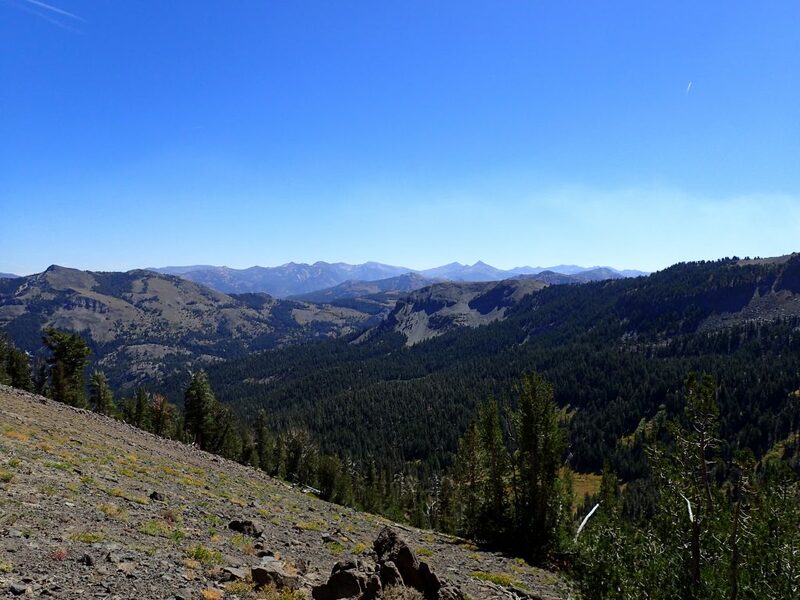 Highland Peak is a remote summit located near Ebbetts Pass in the Sierra Nevada was a delightful fall adventure. Its altitude and isolation make it a destination for solitude seekers like myself. Highland Peak of Ebbetts Pass Fall is my favorite time of year for hiking the Sierra Nevada. With the season come pleasant temperatures, thin crowds and a total absence of mosquitoes. Some years bring early snow and I've been caught in blizzards as early as mid-September. But this year the temperatures were perfect and there weren't even any wildfires. I decided upon a trip up Ebbetts Pass which eluded me in past trips. Whenever I travel somewhere new in the mountains, I'm always looking for the highest nearby peak but there’s plenty to climb nearby. 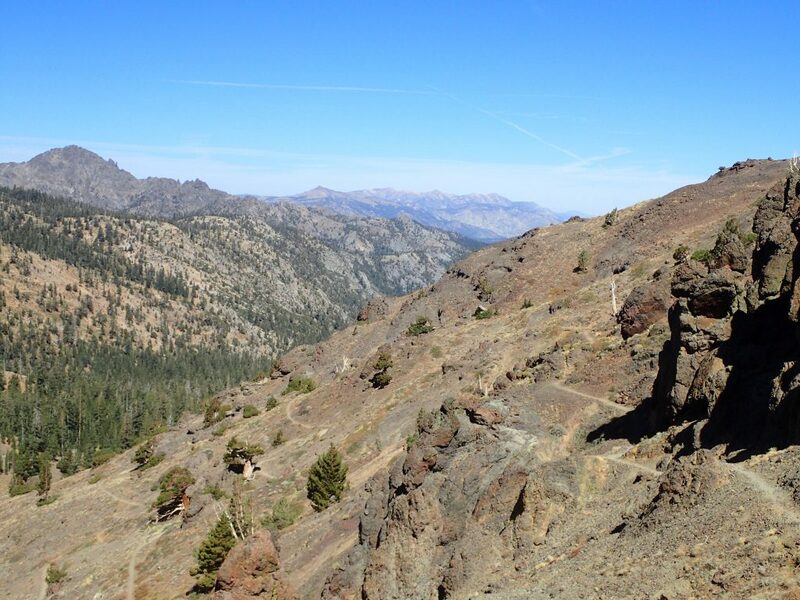 The pass itself is a phenomenal drive and trailheads abound as you head up to the 8,700’ crest. Near Ebbetts Pass there are several summits above 10000 feet. Ebbetts Summit is one of the easier ones close to the pass. Silver Peak is more frequently then Highland Peak but it is about as difficult with the combination of trails and scrambling to the summit. Highland Peak is roughly 10,900 feet in altitude and as I discovered on the summit, only about 20 to 30 people climb it per year. Most like myself approach from the West. From nearly anywhere, set directions to Angels Camp, California. The small town in the Sierra Foothills serves as the last main resupplying for heading up the grade. Smaller towns dot Highway 4 as you gain elevation though the services are limited. Definitely fill up on gas here! From here it's a straight 63 miles to Ebbetts Pass. it took me roughly an hour and a half to make this drive from Angels Camp mainly because there were several spots to pull off the road and take pictures. Be sure to check Caltrans before heading up the highway as it frequently closes even in the summer. Between late October and typically April the highway is completely closed and unplowed in the winter. 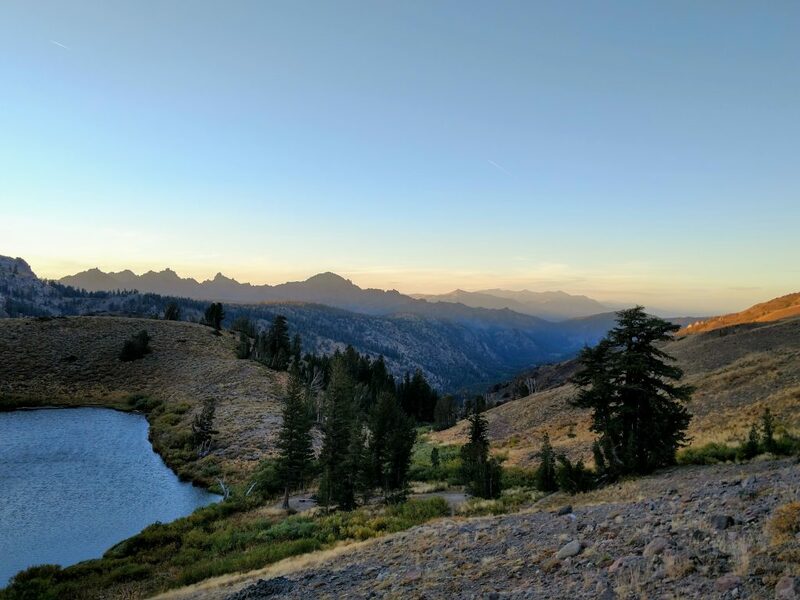 Many consider Highway 4 an exceptionally pretty drive given its remoteness and deep penetration of the High Sierra. Though paved, its mostly single lane through the interior of the Sierras. With dozens of hairpin turns, driving can be a bit hazardous. It's not recommended that any RVs or multi axle vehicles trying to make this drive. Different routes exist usually involving a combination of the Noble Canyon Trail or a scramble from nearby Silver Peak. 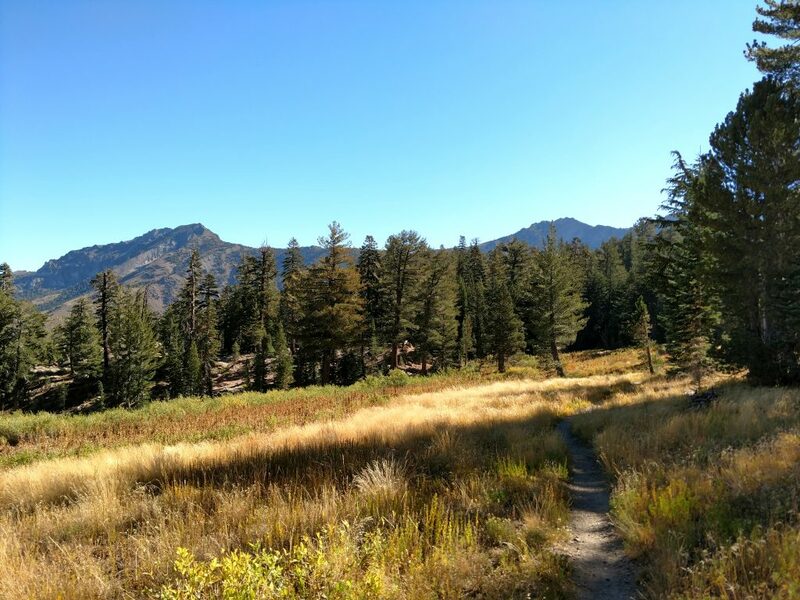 The nice thing about this hike is it includes an outstanding section of the Pacific Crest Trail to Noble Lake. From the parking lots, there's a trail registry should you wish to stay overnight. From here, it's about a third of a mile to the Pacific Crest Trail itself. Take a left at this intersection and enjoy the sweeping views of the Carson range to the north and alpine meadows in front of you. Even in the late fall, wildflowers were blooming for me. It's about 3.5 miles from the connector trail junction to Noble Lake. Unfortunately you lose about 650 feet and gain about 850 feet without any real gain on the summit of Highland Peak. Out on the East Coast, we referred to this as “PUDs” or “pointless up and downs”. Thankfully, panoramic views make the effort forgettable but remember it's the opposite on the way back. Highland Peak and Silver Peak are both in view throughout this section. Although beautiful in their own right, it kind of reminds you of how much work you have ahead of you! I noticed several small streams and Brooks along the way which had plenty of water even in late September. I suspect this means they’re dependable water sources throughout the year. Of course, don't drink from them directly as cattle do graze even at these high elevations. 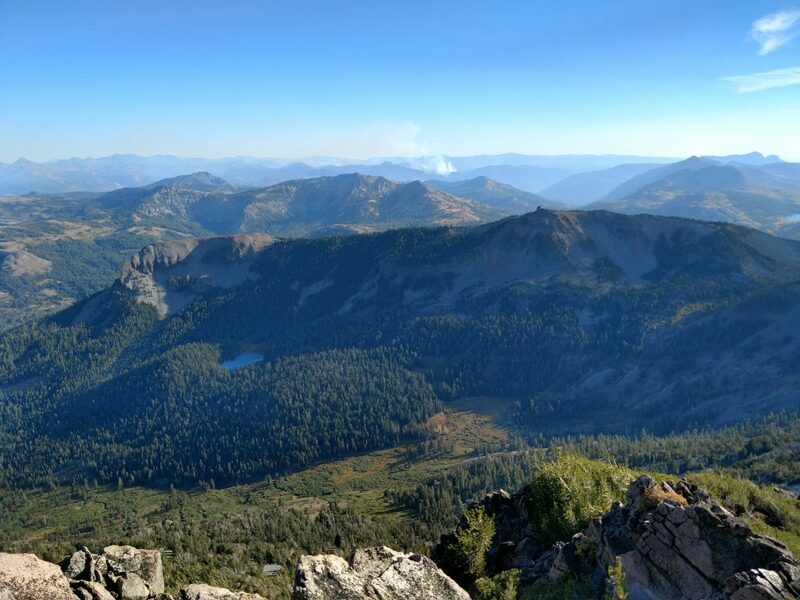 Noble Lake is gorgeous and has a few campsites that may be populated with PCT hikers in the high season. In late September, I hardly saw a soul. From here it's basically “Choose Your Own Adventure” to the summit. Hopefully you're traveling with a reliable GPS, map and Compass like I did. There's a few landmarks that help guide the way. Directly east of Noble Lake and about a hundred and twenty feet above lies a swampy, unnamed pond that is difficult to get around. I found a route that traversed North and a route that traversed East around this lake but both were mucky. The pond is roughly 9,000’ altitude and I rounded the small, flatter arm of the mountain before the pass came in to view. It's a clear pass but unnamed and I found a very steep route over loose dirt to the pass. The pass is at ~9,400’ and a good spot to get your bearings. From here, things become steeper but far more straightforward. It's essentially a straight line up about 2,000 feet in 0.7 miles. Compared to most scrambles, this one is actually fairly Pleasant. The rock is consistent and stable for the most part. There's some sections of scree but they're isolated. I grade it Class 2 with a few Class 3 sections. It's almost entirely exposed but again consistent. In general, I stay to the right side of the ridgeline as I gained elevation. If you're overly committed to remaining on the ridgeline there are class four sections that are very exposed. I don't recommend it. Just below the false summit is a dry patch of scree that I’m sure serves as the headwaters of some creek below- this section was the most difficult of them all. Highland Peak- South Peak is the name of the false summit. 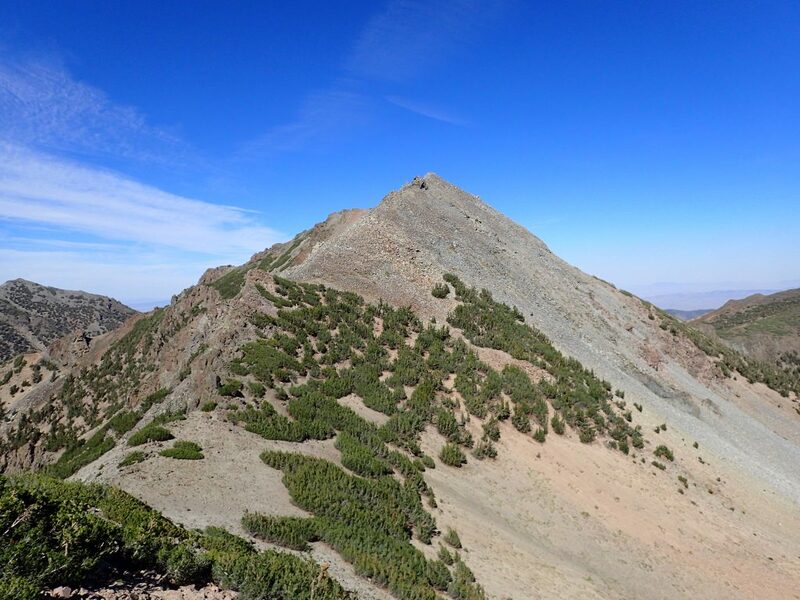 At 10,824’ and with 264’ of prominence it is technically a summit in itself. The views are great but completely forgettable compared to Highland Peak. I searched in vain for a summit register but found none. I expected to lose elevation between the false Summit and the true Summit but its no less disheartening. Between Highland Peak South and Highland Peak itself, you lose about 250 to 300 feet of elevation and it's a scramble both ways. It took me about 1 hour to make this trek. Mercifully, the final climb to the summit is only Class II and on very solid rock. Finally I achieved the apex! 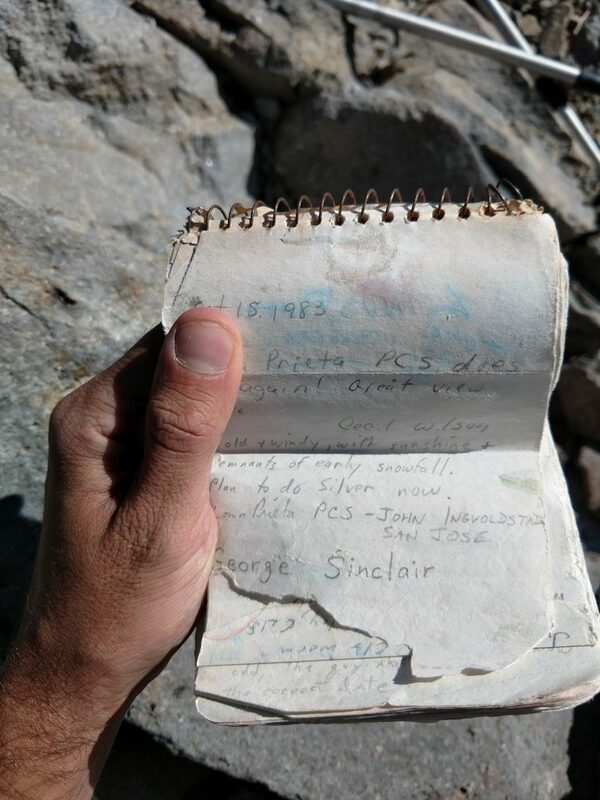 The summit register was one of the best I've seen. It dates back to 1983 and who knows how many climbed it before then. I read signatures of climbers who signed long before I was born adding the the mystique. Perhaps 300-400 signed the register and only 18 signed this year. Clearly this summit receives very few visitors! I love that about a mountain. As is typical with scrambles, it took about as long to climb up as it did to climb down. Its far harder on the joints to down climb a mountain like this and I made it to the lake around 7PM- close to sunset. Fortunately I had a full moon to light my way back the "pointless-up-and-downs" of the earlier section. After 10 hours of hiking and scrambling I made it back to the car! Highland Peak is an exceptional climb. The fact that only 18 made it before me demonstrated its remoteness. Though I didn't get to climb nearby Silver Peak like most do, I'm happy I made it to this remote summit. Hope this trip report helps you along the way if you make it out here!